It’s a two word phrase we hear way too often as producers. That’s because no matter if it’s your first time or your 100th time writing a song, it’s still a concept that most producers struggles with. You’ve just started a new project, and you’re overwhelmed. But after you finally decide on where to start, nothing seems to work. It feels like it’s going to take ages for you to go from a blank file to a finished track. Believe it or not, even the best songwriters encounter this problem all the time. But they’ve actually mastered their craft to a point where they can move past writer’s block comfortably. This allows them to write incredible songs FASTER than most people can even read through this article. Because the thing is, YOU can do the same thing. It really just comes down to a few simple tricks that most producers don’t know about. And once you learn these techniques, you’ll be able to blaze through writing a song in no time! Songwriting Tip #1 - Get Inspired. This is the easiest and most straightforward way you can get ideas for a new song. But usually the first step to find inspiration is to look at other artists’ music. This is no secret. But…. there’s a better way of finding that spark then just going through the playlist on your Soundcloud for inspiration. 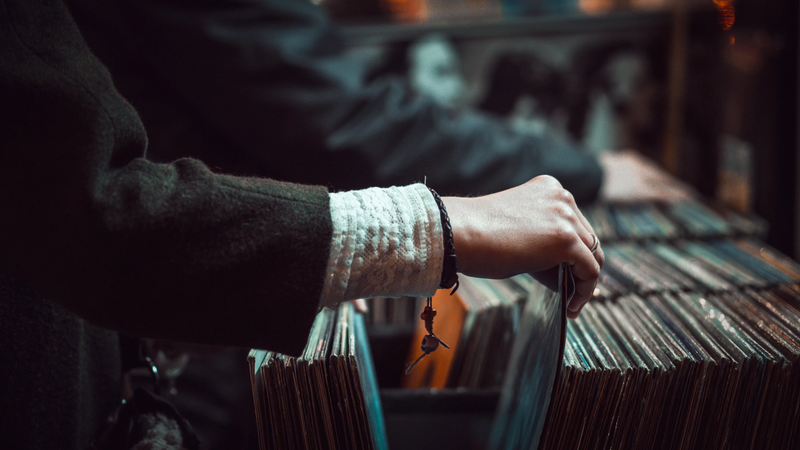 Go record digging for OLD tunes and sample them. Instead of looking at what’s trending right now, look back at the timeless tunes that may have been created years, even decades, ago. They’re timeless for a reason. Pick 2 or 3 of your favorite tracks right now and listen for specific elements in them. Try to figure out what parts have attracted you to that song and try to recreate them. Go to a live show and take note of how a specific song made you feel. Then try to translate the emotions you felt into your own song. That’s the whole point of creating music for a lot of producers in the first place-- to communicate emotion. Look to art or visual elements for inspiration -- Visual art can easily spark emotion, just as music does, so it’s easy to translate visual art into audible art. Spend some time outdoors -- Take in the sights and sounds of nature, and apply it to your work. Maybe even bring a field recorder with you to record your experiences. Watch a movie --They have strong audio and visual content that will help give you some ideas. Try any of these, and we promise they will definitely help. Another thing you can do to better prepare yourself for songwriting is to get familiar with any software that you use regularly. This will benefit you because your software is the main tool you use for production. And the better you know your software, the easier it is to take ideas from your head and translate them into your DAW. There a couple of ways you can learn to be more efficient when it comes to your DAW, no matter which one you’re using! But for the purpose of this blog, we’ll be mostly covering Ableton Live, FL Studio, and Logic Pro. This may seem tedious, but you’ll definitely thank yourself later. Reading through the manual will make a HUGE difference, because you’ll probably discover a ton of features you had no idea existed. At the very least, it’ll teach you how to optimize every feature and work more effectively in that program. Using these steps with your DAW alone will help you tremendously. But if you also apply these steps to any other software plugin or VST you use with your DAW, you’ll be able to unlock your full potential with songwriting. Also if you’re interested in learning more about VST’s in general, go here. Sometimes, it seems like no matter what sample you choose, or what preset you pick, you just can’t find the sound you’re looking for. That could simply be because you don’t actually have it! But by building an extensive library of thousands of sounds, you’ll never run into this problem. And the good news is, we have SO MANY free resources that you can download to expand your collection. We actually put together a giant discography where you can get every free download we’ve ever released in one spot.That way you don’t have to search through our entire website to find the ones you want. Go here to get the entire Cymatics Discography for free: Cymatics.fm/discography. It contains some great free resources, but if you really want to make sure you have the highest quality samples and presets, then one of your best bets is check out Academy.fm. This site actually offers producers access to hundreds of different high quality soundbanks in every genre and style! And the craziest part is, you can actually get a full 30 days on this platform for just $1. These resources will definitely give you enough samples to work with, but after you download ALL the ones you’d like, it may get a little chaotic! This is why it’s also CRUCIAL that you stay organized. A bunch of sounds randomly scattered all over your computer aren’t going to help you when you are trying to find something specific. So, make sure to organize your sounds by labeling them and categorizing them into folders. After these few steps, you’ll be able to find exactly what you’re looking at the exact time you need it to speed up your workflow. When nothing logical is working, why not try something a bit illogical? Play more than one song at once on different speakers. This is called called aleatory music, which means you are leaving part of your writing process to complete chance. Force yourself to work on a time constraint. Perhaps plan to finish a drop in 15 minutes. Chances are you will get it done, and you’ll just have to polish it! Use the draw tool in your DAW to scribble notes. Draw random notes with your draw tool. This is another form of aleatory music. 90 percent of it will sound like absolute garbage, but stick with the bits that actually sound good, you’ll be surprised! There are many web resources designed to help producers like you come up with their next hit. Auto Chord - quickly build chord progressions in any key and a variety of styles. Hooktheory - build chord progressions based on trends, even browse a database of chord progressions used in actual songs. Masterwriter- masterwriter is a resource to help you easily write lyrics for your next track. Amper Music- use this tool to get artificial intelligence to help you write your next track. Using tools like this will help your songwriting process go so fast that it’ll almost feel like you are cheating. There are a huge variety of online courses available to you as a producer. They are designed to educate you on how to perfect your production skills and teach you methods you would otherwise not know about. Academy.fm - Learn from hundreds of different courses and tutorials on anything and EVERYTHING anywhere, anytime and from a variety of professional producers. You can also watch huge artists and professionals create tracks in live time through the livestreams. Master Class- learn about music production through online video courses from industry professionals such as Deadmau5 and Hans Zimmer. Producer.dj - This site is dedicated to video tutorials as well. This website works with artist and producer Ill.gates. Mr. BIll’s Tunes - This is producer Mr. Bill’s personal site dedicated to helping you master Ableton Live. There are lots of good resources on here, and he covers pretty much everything involving Ableton Live. And we’re not talking about an intergalactic space creature. Just because you can’t come up with anything at the moment does not mean your friend can’t. Reach out to your friends or relatives and see if they want to be part of your project. They don’t even have to be musicians themselves. Regardless of what they can contribute, you’ll always learn something since each person has a different viewpoint. Don’t go into writing cold. Come up with a concept before you’ve even opened the new project file. Get out a piece of paper and write down what you want your track to be before you’ve even started it. Write a short story. Create an atmosphere. Make an illustration. Or you can be more logical by having every specific detail mapped out. Create a template. List chronologically what you want to happen in the song. Describe the patterns you would like to create. This is by far one of the best ways you can prepare yourself not to be overwhelmed when opening a new project file! Many artists stick in the same BPM range and style for much of their career. By doing this, you may be causing yourself to be less effective. Trying new genres causes you to push the boundaries of your normal production. By doing this, you also might discover new techniques to use in future production. This is by far one of the best ways to get better as an artist, and add more value to your production. If you can be flexible in multiple genres, you can basically do whatever you want when it comes to music. This skill is not valued as much as it should be. Don’t be afraid to make something that sounds like nothing you’ve done before! Who knows? - It might become your most popular track! You are constantly collecting new information and improving to perfect your craft! Think about how far you’ve come since the very first time you opened your DAW. The rate that our abilities improve as humans is mind-blowing! You’re a better producer now than you were when you first started reading this article! This is why you shouldn’t be afraid to revive an old project with new knowledge and ideas. If it’s been awhile since you last opened a particular project, chances are you’ve learned something new that could breathe new life into it. This is especially nice when you’re facing a block in your writing or wanting to start a new track. Dust off your old project files. You’ll be surprised. There might be some gems. Also use this as an opportunity to clear up some space and maintain your files. We recommend going through old project files every so often and delete the ones that you absolutely won’t be using. Much like sampling, it’s okay to use a chord progression from a track you love. Musicians re-use chord progressions all the time, simply because they work. Sometimes you have to just use what's out there and put your own spin on it. So of course, be creative, but you don't necessarily have to re-invent the wheel. Songwriting Tip #12 - Don’t Be Afraid To Abandon A Project. Sometimes you have no option and sitting on a project where nothing is working is hindering you more than progressing you. Maybe you just need to give the project a break. Instead, save the project for later. Come back to it. Maybe the ideas will flow then. For now, look at other files you have going or start a new one. By using a project file template, or pre arranged midi files, you can make your songwriting process go much quicker. Songwriting isn’t easy by any means, but these tips are sure-fire ways to help you improve! When in doubt, search for inspiration in other artists. Know how to use all of your software to it’s full potential. Build an organized library of sounds to choose from. Don’t be afraid to think outside the box in order to come up with an idea. Use as many web resources to your advantage as possible. Enroll in online courses to further your understanding of music production. Collaborate with others in order to share knowledge. Create a concept before even opening a project file or even create an outline beforehand. Don’t stick to one genre or BPM, experiment with different ideas. Look through your old project files and revive them if they are good. Don’t be afraid to borrow a chord progression from a song you like. When all else fails, abandon a project. Use templates to make songwriting faster. Be sure to remember these tips in the future, and you’ll be much more prepared as you continue your journey with songwriting. How do you get out of writer's block? Do you want to get a jump start in Ableton Live? Download our free Ableton Starter Pack and get level up your production today!